We reported yesterday that Fox wasn't going to air a Deadpool 2 trailer during Super Bowl 2018, but predicted that the Merc with a Mouth would have something to say about it on social media. However, Deadpool took it one step further and live-tweeted throughout most of the game and if you're a fan, you're going to love the results. First call out of the gate was a burn on Fox for being too cheap to shell out $5 million on a commercial to promote Deadpool 2, which is what we all anticipated. Wade Wilson ran commentary throughout the game, even mentioning the coin toss and showing off a new coin with his face and rear end on them. He captioned the photo by saying, "Heads or Tails. When a coin looks this good, we're all winners." The jokes ran casually to general calls about the game and the sport in general, to some pretty outrageous anecdotes. Deadpool insinuates that Tom Brady is also a mutant with healing powers early on in the game and congratulates Doritos and Mountain Dew for their new commercials featuring Peter Dinklage and Morgan Freeman lip syncing to Busta Rhymes and Missy Elliott, respectively. The Merc with a Mouth even hinted at his pansexuality while revealing the true reasons that he likes to watch the game. The superhero admitted to liking the game because of the men running around in "shiny pants." He had this to say. "Anything centered around a bunch of muscular, athletic men manhandling a leather ball has my vote. The shiny tights are just icing on the cake." 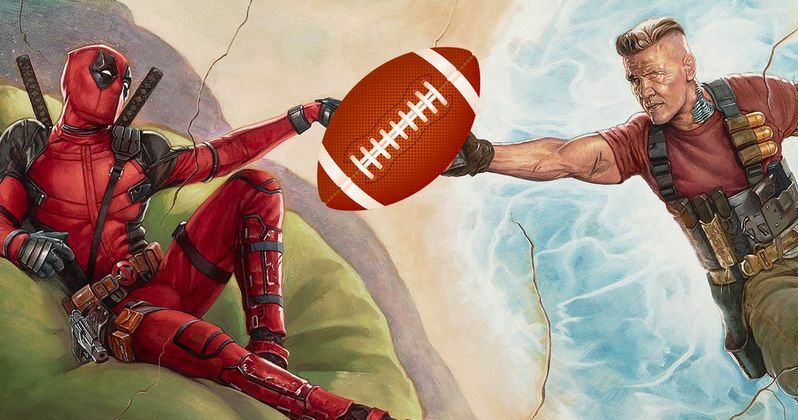 Deadpool also had time to mention the world-famous "deflategate" from the 2015 Super Bowl. He then proceeded to make a joke about deflated footballs, his face, and the look of testicles. Again, this commentary is only for true fans of Wade Wilson. There was no Deadpool 2 trailer during yesterday's big game, but the wait is nearly over since it has been confirmed that we will see the first trailer for the movie in a few weeks. It was recently revealed that the first Deadpool 2 trailer will play in front of Marvel's Black Panther on February 16th when the movie opens and continuing with tradition, the trailer will drop online beforehand, on the 14th, which is Valentine's Day. The first movie opened on Valentine's Day weekend. If Deadpool 2 doesn't pan out, Ryan Reynolds as Wade Wilson may be able to parlay his Super Bowl live-tweeting into a paying gig with the NFL. That probably won't end up happening since Deadpool 2 is on track to be a huge success, just like the first movie and may even top it with the addition of Josh Brolin as Cable. It's going to be the summer of Brolin when he appears in Deadpool 2 and Infinity War within weeks of each other. Check out the live-tweets from a super football fan below, through the Deadpool Movie Twitter account.